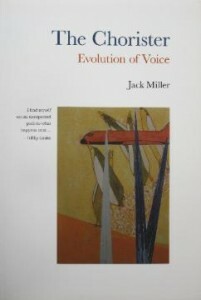 In The Chorister: Evolution of Voice, Jack Miller conducts for us twenty-nine of his curious, full color art images and the stories they caused to come into being, including: a turtle man who finds his place between the species; five siblings who share one large garment and dazzle crowds with their odd work ethic; a bereaved kid brother who finds a way to sleep well despite his own pressing mortality; a variant of rabbit who, though outcast, takes his place at a very important table; and more. The prose poems and short stories tell us of imperfect characters who start in predicaments of everyday living and respond with tenacious striving to live better. From starting an undersea utopia to dramatizing a long overdue apology, we see characters who will never be celebrities, but cannot help but be the heroes of their circumstances. The author’s family has many scientists and intensely creative people. It makes sense that he studied art and science together since early childhood, and that in The Chorister he is avid like an artist for the beautiful and the offbeat, yet diligent as a scientist who wants to be clear and forge ahead. The images are engaging and quirky, the storytelling flows, yet the intensity of writing suggests this book be read a few pieces at a time rather than straight through. A book for the nightstand rather than a day at the beach.